Jim? : White can move in for the kill above, instead of playing more options, by connecting to left-side option. Bill: Not to prevent White from getting to the fourth line. (Much later.) 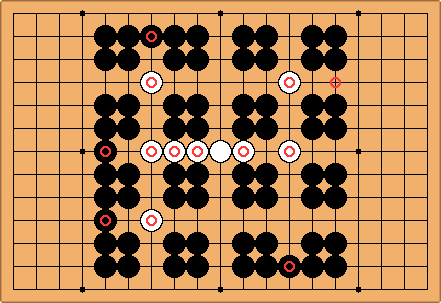 Bill: It seems that Black is not allowed to play below the fifth line. That restriction was not originally clear. 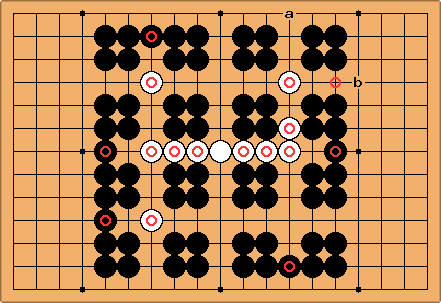 That means that all White has to do is connect to the fifth line. (Much, much later.) 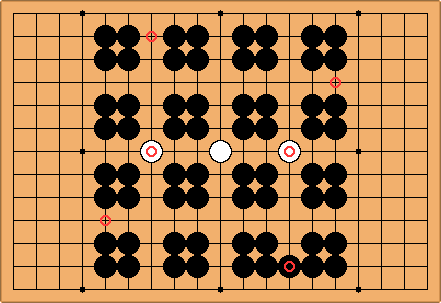 Bill: Actually, it seems that Black can play below the fifth line, but that White can then capture Black's blocking stone on the fourth line. This is not a pure connection game.